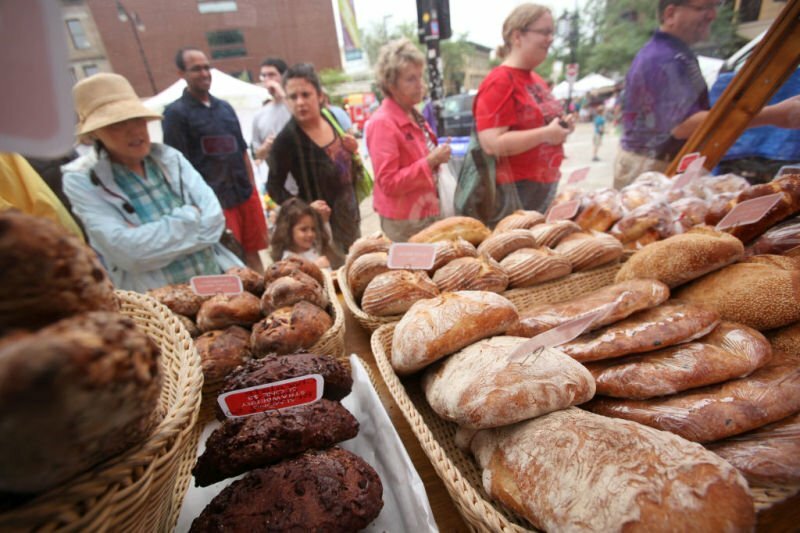 Customers check out the bread for sale at Stella's Bakery during the Dane County Farmers' Market downtown last year. The outdoor market on Capitol Square opens Saturday. Market-goers shop for baked goods at the Elkhart Lake Farmers' and Artisans Market. A sign at the entrance of the Fondy Farmers' Market directs shoppers to the hot food and produce for sale. Market shoppers peruse produce options at Kenosha's Harbor Market. Maple syrup is often one of the first items available for sale at farmers' markets in the spring, including the Mineral Point Market shown here. Vendors sell their produce and other goods, which include pickled and preserved items, at the Reedsburg Area Farmers Markets. As our fingers and toes finally begin to thaw, so does the ground, bringing with it the first spikes of asparagus and leaves of spinach. And that means farmers’ markets are ready to set up shop. While it’s hard to beat the selection and atmosphere at Madison’s Dane County Farmers’ Market, (the largest producer-only farmers’ market in the United States, according to its website), Wisconsin is fortunate to have hundreds of markets across the state, offering shoppers not just fresh produce, but arts, crafts, live entertainment and prepared food to enjoy while seeking out the perfect tomato. “It says a lot about the people of Wisconsin that we have such a proliferation of farmers’ markets,” said Miriam Grunes, executive director of the REAP Food Group, based in Madison. REAP produces the annual Southern Wisconsin Farm Fresh Atlas, which along with five other similar publications, lists a total of almost 300 farmers’ markets across the state. “We support these markets because of the fresh, high-quality products and the chance to directly support the producers, but also because these markets connect us with the strong agricultural heritage of our community,” Grunes said. Opening day for the outdoor Dane County Farmers’ Market located around the Capitol Square is Saturday. Market-goers also can find the REAP atlas there, in addition to other locations and online at www.reapfoodgroup.org. What makes it special: At this market, artisan vendors outweigh the number of produce vendors, offering shoppers everything from metal sculptures to wood-working projects and antiques. But organizers stress, this is not a flea market. “We try to keep the focus on antiques or items that are handmade and hand-crafted in some way,” said Rachel Risse, secretary with the Elkhart Lake Area Chamber of Commerce. Location: 2200 W. Fond du Lac Ave., Milwaukee, one block north of North Avenue. Vendors: About 30 to 35 on Saturdays and 10 to 15 during the week. What makes it special: Need some ideas of how to cook your latest market purchase? The live cooking demonstrations every Saturday at the Fondy market may be your answer. The cooking demos, along with family arts and crafts activities and live music, happen from 10 a.m. to noon every Saturday. “Saturday is a party day,” said Nancy Ketchman, director of development and communications for Fondy Food Center. “Everyone comes together to celebrate food and diversity.” In addition to the weekly markets, market organizers also hold a few special events throughout the summer, including a barbecue contest and greens cooking competitions. “The festivals also feature music, petting zoos, face painting, even cabbage bowling,” Ketchman said. Location: 139 N. Broadway, Green Bay is the address for the market center, but the market itself spans Broadway from Walnut to Dousman streets. When: 3 to 8 p.m. on Wednesdays, June 4 through Sept. 3 and until 7 p.m. through October. What makes the market special: This weekly evening market is a weekly festival as much as it is a traditional market, complete with hot dogs, cheese curds, bubble tea and kettle corn along with other diverse foods. “Each week Broadway is closed to traffic so the street becomes a pedestrian zone for the market,” Christopher Naumann, executive director for On Broadway Inc., which runs the market, said in an email. “Just over half of the vendors sell traditional market produce, while the other half is (a) combination of businesses, arts and crafts, and other locally prepared foods and products.” There’s also a beer and wine garden, two music stages and interactive booths throughout the market, he said. What makes it special: Three different music venues each Saturday offer plenty of entertainment at this farmers’ market. Performances include folk guitar, jazz, show music, opera and string quartets, said Ray Forgianni, market president. The market has a variety of produce and food, including meats, cheese, seafood, sausage, breads and pastry; but also offers a wide selection of arts and crafts, including paintings, jewelry and clothing, he said. What makes it special: Reedsburg’s annual Fermentation Fest, now in its fifth year, is becoming more widely known, and the popularity of pickled and otherwise preserved items is evident at the city’s markets. “Several of our growers have state certified kitchens and they bring in (items including) pickled beans and pickled cucumbers,” said Kristine Koenecke, executive director of the Reedsburg Area Chamber of Commerce. The market also offers a wide selection of fresh flowers, including hanging baskets in the spring and “enormous” mums in the fall, she said. “It’s really easy to get what you need,” at this market, she said. 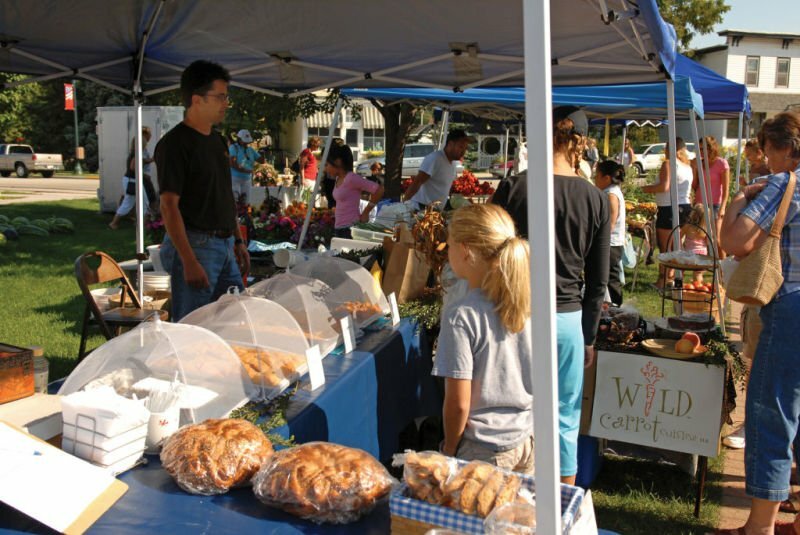 What makes it special: A visit to the Tosa Farmers Market will introduce you to various businesses and community organizations, in addition to farmers. Each Saturday, the market has two rotating booths, one for a business and another for a nonprofit. Businesses such as Royal Roost have a Saturday where they help people understand backyard hen-keeping, said Katie Hassemer, Tosa’s market manager. The market is fairly new and will be starting its fifth year this spring. Hassemer said the market offers a nice variety of produce and prepared foods. One of her favorites is a frozen soup vendor who offers samples from a crock pot at the booth. People don’t always think about buying hot soup in the summer, but it’s nice to have in the freezer, Hassemer said. Location: This year the market is temporarily relocating to the corner of Rock Avenue and Jefferson Street in Viroqua. What makes it special: Handmade Amish goods plus a high percentage of organic farming make this market located in Vernon County a standout. Viroqua is one of the largest centers for organic farming in the state, said Kaitlyn Karasek, the farmers’ market manager. “We are like this amazing little nest for new farmers,” she said. The region also boasts many Amish farmers, who sell hand-crafted items including quilts, aprons, belts, key chains, benches and Adirondack chairs at the weekly market.